To get started with setting up your quote parts, you’ll need to navigate to your company’s quote settings page. You can do so with the button above. NOTE: you must be an Admin on your D3M organization’s account to do so. You can easily add parts to your company’s Quote Part List by simply typing in a unique part number, name, description, unit price & unit cost as required. When hitting enter on your keyboard the Quote Part will automatically be saved and can now be used by you and your colleagues when creating quotes in D3M. Entering a large number of parts manually can be time consuming and unmanageable. Alternatively, you can upload a CSV file with all of your quote part information. Part Number (required) - Usually a series of digits and letters used to uniquely identify a specific part or product. Name (required) - The name of the part or product. Description (optional) - A short description of the part or product. Price (optional) - The price of a part or product that you offer to your customer. Cost (optional) - The cost to you to purchase a part or product for resale. Once you have a CSV ready, upload it to D3M using the dashed grey rectangle shown below (find that in your D3M Quote Settings). 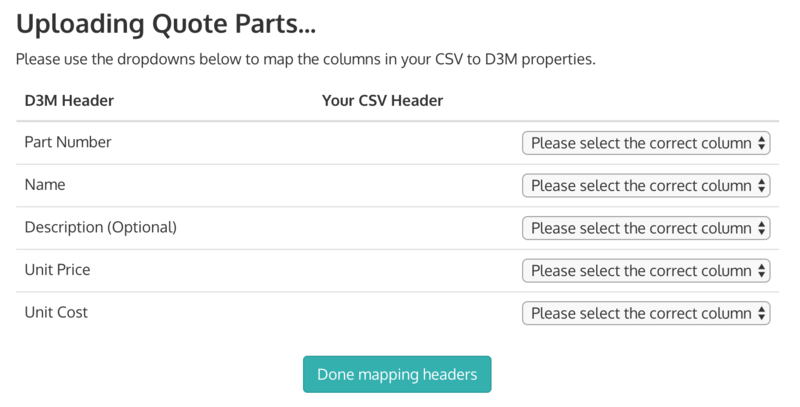 Once you upload the CSV, D3M will ask you to select which columns in your CSV match each piece of data mentioned above. Simply select the correct column for each dropdown and click Done mapping headers. You can change the data in your CSV and re-upload at any time and it will intelligently update your quote data. If you would like a CSV template that you can manually fill out or copy-and-paste values into, you can download our CSV Template and upload the result when you have completed entering all your data into it. Once your parts have been uploaded we make it very easy for you to update them as required. You can either make changes directly in D3M by searching for quote parts and modifying or deleting them or you can upload an up-to-date CSV and your quote parts will be updated intelligently. Any parts that are not present in the upload will be deleted. Everything else will be updated or added respectively. If you need an up-to-date CSV to make modifications to, make use of the Export CSV button to download a file that you can modify and re-upload.